“When I was eighteen, Uncle Sam told me he’d like me to put on a uniform and go off to fight a guy by the name of Adolf. So I did.” When Alan Cope joined the army and went off to fight in World War II, he had no idea what he was getting into. This graphic memoir is the story of his life during wartime, a story told with poignant intimacy and matchless artistry. Across a generation, a deep friendship blossomed between Alan Cope and author/artist Emmanuel Guibert. 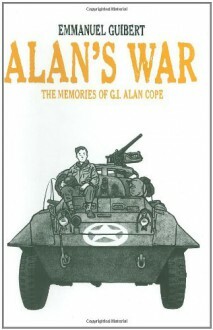 From it, Alan’s War was born – a graphic novel that is a deeply personal and moving experience, straight from the heart of the Greatest Generation – a unique piece of WWII literature and a ground-breaking graphic memoir. I confess to not finishing this. I'm afraid that Alan's war was too personal, too microcosmic to hold my interest for long enough to hook me. I wanted to like it more than I did.